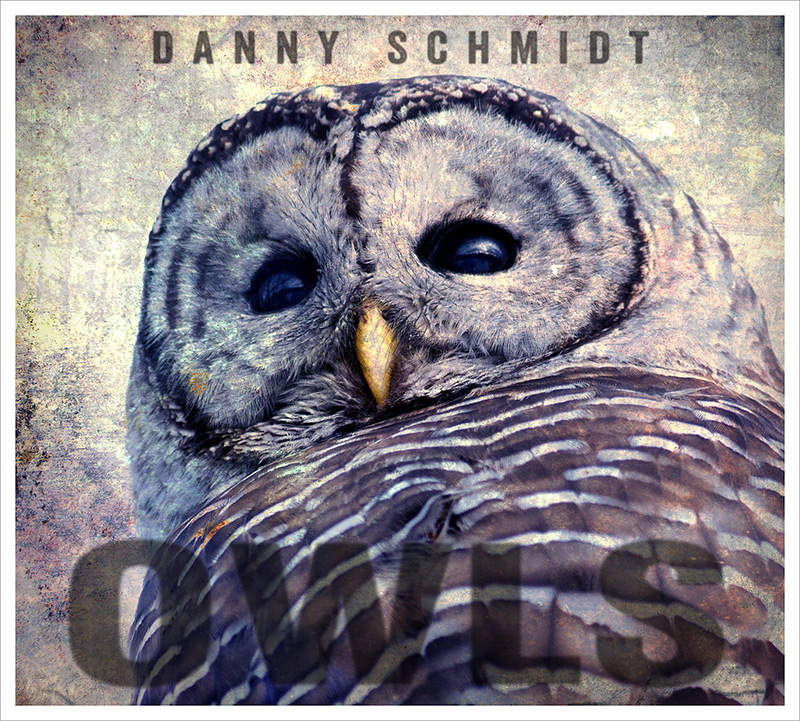 The stunning owl photos used in the album design are by a photographer named Michel Soucy. To learn more about Mr. Soucy and his work, please CLICK HERE. Like I've said about some previous releases, I don't start off with a thematic concept and build a record from there. I write the songs as they come to me, and as the production unfolds, and as I have time to reflect on what common threads run throughout the songs, as a collection, themes begin to emerge. So, as I was recording the songs that were to become the Owls album, I realized that many of them had taken on a sort of mystical tone. They asked existential questions, and they told stories of personal discovery, growth and transformation. But they did so in symbols and metaphors more than in actuals and specifics. And so, as I thought about the songs together in one unit, I started picturing them as a row of owls, perched overhead, side-by-side on a branch, somewhat ethereal in their nature, quietly and knowingly observing us go about the process of figuring out our lives. Simpathetic, but aloof. Almost like grown-ups watching a child fumble through trying to put a puzzle together. So I called the album, Owls. The songs, individually, deal with the puzzles of Relationship . . . our relationship with ourselves and with our lives, our relationship with others, and our relationship with the earth . . . and they deal with the puzzles of Identity and Transformation, and our ever-shifting sense of ourselves in the mirror of ever-changing circumstances. I'll speak more to the songs, individually, below. I don't know, specifically, why these songs came at this time. Maybe because I'm getting older and entering "middle age," and because after you've commited a certain significant chunk of your life to an endeavor, you start to ask if it was worth it, and if it has any real value. Maybe because I got married, and the process of merging your life with another person is one of not just learning who they are, but learning who you are through them. I don't know, honestly. I just know that most of the characters in these songs are going through some sort of self-evaluation and self-transformation, for better or for worse. I hope you enjoy the album, and I hope you're able to spend some time absorbing this new batch of songs. I think they have more layers than any I've written since the Parables & Primes batch from almost a decade ago. This song is a sequel to Dark-Eyed Prince from the Parables & Primes record. It continues the tale of a poor skittish romantic who keeps trying to reach out into the world and connect, only to be driven back into a castle of solitude by his own darker demons. There were hints in that first song that he knew the demons actually lived in the shadows of that castle, and some hope that through the illuminating eyes of some compassionate lover, he might be able to one day meet those demons' glares, and make some kind of peace with them. Well, god bless him, he may have found just the right love. I imagine them, in the end, fighting alongside one another, against each other's demons, with trashcan lid shields and bucket helmets. But at least they're not running. This one revolves around the issue of gun control, but not so much from a political perspective as from a personal sense of exasperation. It's not trying to preach any particular answer to a complicated issue. It's more just asserting, after day after day after day of crazy headlines: Something is obviously broken and needs fixing. We should be able to sit down as grown-ups and fix this thing. We can argue the politics of how best to fix it. But I can't imagine, at this point, any reasonable human crossing their arms and saying there's nothing broken. This one is the Earth telling us that if we don't pick up our toys and clean our rooms, she's going to take them all away from us. It's a simple message we give to a four year old, and it resonates universally. Again, like Guns & The Crazy Ones, I continue to be flummoxed by our collective ability to deny problems for the sake of keeping a clean political scorecard. We don't need to polarize ourselves around every issue. Some things we all know to be true, and we should allow ourselves to agree on. We need to respect and honor our home. Does anyone really disagree with that? This is a song about divorce, about loss and regrowth. It's the story of a character who finds himself with fallow fields, and only half his old capacity to farm them. This song is about drawing inspiration from the beautiful "mistakes" in life. I took the liberty of using some of the most glorious natural features of our world, and attributing them to god's errors, and saying, what the hell, if god can make lemonade out of lemons, maybe we should keep our chins up. This song is a life-cycle parable about how our relationship with our own shadowy darker side evolves as we move through life. It's always been my contention that we can never fully repair the cracks in our own character and psyche, but our relationship with that part of ourselves continues to evolve, sometimes driving us, sometimes embracing us. This song cycles through the phases. This song is a Who What Where and When of people-watching. There's some micro-relationship that forms when we watch people live their lives, even from a distance. And it always seems to move from detached observation to more active introspection. This song is about the crossing of that line. This is a song about the process of catharsis. It's the tale of a woman who has closed herself up for self-protection, and who is now releasing all of her pain and suffering, and tiny step by tiny step, opening up and reemerging back into the world. As we get older, and as life gets fuller and fuller with projects and people with whom we want to immerse ourselves, the days seem to get shorter and faster and foggier. I started imagining our lives as books of journal entries. And as our lives fill up and speed up, the pages start flying out of the book in furious fashion, leaving us almost empty. I'm not sure if there's a way to ever slow things down. But I liked the idea of those pages folding themselves into beautiful little birds, and if they're going to fly out of the book, they could at least fill the sky with origami memories. This is a song about someone drifting off into an abyss. But more, it's a song about being that friend to a person who's drifting off into an abyss. I think we've all had the experience of watching someone we love come ungrounded. And it's a really sad helpless feeling. We do what we can to moor them back down. But sometimes, at a certain point, all we can do is watch them float away. And then sometimes we just can't bring ourselves to watch, anymore. And all we can do is drop our eyes and reel in our line. I think we've all been on either end of that line at one time or another. But it sure is a lonely feeling when one side of the line goes slack.